Consumer Electronics Market size was valued at over USD 1,100 billion with a global shipment of over 2.9 billion units in 2016. 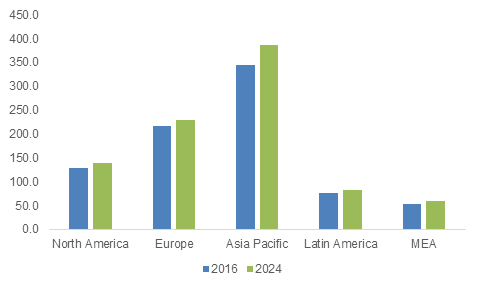 Increasing penetration of smartphones across the globe is expected to drive the consumer electronics market growth over the forecast timeline. It can be attributed to the availability of advanced features such as fingerprint scanners, high-resolution display, and powerful camera systems followed by the cheaper mobile data services across various regions. With the gradually declining prices of smartphones, the number of users across various regions worldwide is increasing at a rapid rate. Growing number of users coupled with a stagnant replacement cycle of as low as two years is further contributing to the consumer electronics market growth. The demand for televisions with larger screen sizes integrated with new technologies such as 4K and OLED is on the rise across the globe. The number of vendors offering such advanced technologies is increasing with players such as LG Electronics, Sony Corporation, and Samsung Electronics in the marketplace resulting in rising competition. In addition, growing popularity of OLED and 4K televisions followed by the declining prices of these devices is providing impetus to the consumer electronics market growth. With the falling prices of such devices coupled with the growing replacement rate of traditional televisions with newer ones, adoption is expected to increase over the forecast timeline. The imaging equipment industry is currently witnessing a huge decline in sales since past few years followed by the manufacturing rate dropping year-on-year. With the increase in smartphone photographers, the number of individuals using digital cameras for photography applications is shrinking at drastic rates. The phone cameras are getting better and providing decent quality of photos and are anticipated to improvise further over the years. Growing preference of users toward smartphones as compared to making investment on a DSLR camera, further restraining the digital photo equipment in the consumer electronics market. Moreover, considering the shrinking camera industry, players such as Canon and Nikon are making a transition towards professional application. The audio & video equipment sector is predicted to witness significant growth over the forecast timespan. It can be attributed to the rising penetration of smart technologies integrated into every-day audio and video electronic equipment such as TVs and speakers. These are equipped with remote monitoring and sensing capabilities and can be integrated with artificial intelligence to increase user convenience. In addition, the development of new technologies such as 4K, 8K and higher resolution systems is further contributing to the consumer electronics market growth. Major household appliances segment in the consumer electronics market is growing owing to the rising disposable income of individuals across various regions. Improving living standards and proliferating number of households followed by the rising requirements for the replacement of older electric household appliances is fueling the growth of major household appliances. The growing demand for energy efficiency contributes to the growth of advanced refrigerators. In consumer electronics market, the personal application segment holds the largest market share in 2016. This is largely due to the rising prominence of advanced and wireless technologies in the earphones & headphones industry. Rapid globalization and the industrialization in the Asia Pacific region is leading to a rise in the disposable incomes of the working and middle-class population. Due to this, an increasing number of consumers can now spend a larger portion of their income on such products. However, the personal application segment is facing huge challenges in digital photo equipment industry owing to the advancements in smartphones and tablets market integrated with advanced cameras that offer high quality pictures and videos. Players in the industry have started targeting professional customers, which will increase the prices of the cameras and camcorders over the future. Wide scale residential and commercial development projects in South-East Asian countries such as China, India and Japan are aiding in the growth of the consumer electronics market. This demand is further streamlined by the increase in global economic conditions and the higher dependence on technology for the operations of every-day activities. Moreover, high disposable income of households in Asia Pacific is spurring the demand for best electric household appliances, whereas the demand in some regions is for appliances with basic features. Owing to this the region is witnessing an increase in competition is with European companies trying to enter the region. 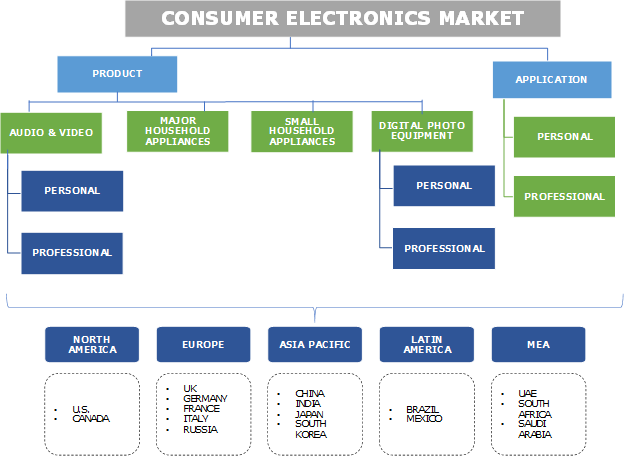 Companies in the consumer electronics market include Samsung Electronics, Apple, General Electric, Huawei, LG Electronics, Sony Corporation, Bose, Sonos, Sennheiser, AB Electrolux, Haier, Canon, Nikon, GoPro, etc. The industry is highly fragmented in nature owing to the presence of large number of well-established and recognized players in the marketplace. Furthermore, the players are increasingly investing in R&D and exhibiting mergers and acquisitions and partnerships as key growth strategies to gain competitive advantage. The strong presence of established players in the marketplace poses high entry barriers for new players entering the consumer electronics market. The consumer electronics market is characterized by high fragmentation. For consumers and authorities’ sustainability is becoming more vital, the demand for manufacturers to develop and deliver sustainable products is growing. This trend has been present for several years but the development is now accelerating at variable paces in different regions. Companies are now focusing on constant productivity improvements in several product costs as well as structural costs owing to the competitive cost structures. Manufacturers are also relying on collaborations and acquisitions to gain a larger consumer electronics market share.